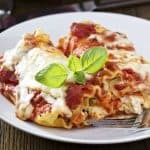 Crock Pot Lasagna is my new favorite way to make lasagna! No need for an oven! Lasagna noodles, meat sauce and lots of cheese made all in one pot! Brown and crumble ground beef in a large skillet. Then add in onion and garlic and cook for additional 1-2 minutes. Drain excess grease from beef and put back into skillet. Pour in spaghetti sauce and water. Spray crock pot with no-stick cooking spray. Scoop approximately 1 cup of meat sauce into bottom of slow cooker. Top with one layer of uncooked lasagna noodles. Just do your best to break them up to fit into your crock pot. Next top with a layer of cheese mixture. Keep adding layers, ending with meat sauce. I was able to get 3 layers in my 5-quart slow cooker. Put the lid on and cook on low for 4-6 hours. You want most of the liquid to be absorbed and noodles should be soft. When it is finished cooking, add remaining cheeses and sprinkle with parsley. Put the lid back on for about 10-15 more minutes until cheese is melted. Slice and serve it up with a salad and some garlic bread.